Released in 2010 "Paper Man" has the quintessential indie film elements that worked well for Sophia Coppola's "Lost in Translation". It works as well thanks to the performance by Jeff Daniels, Emma Stone, Ryan Reynolds, and Lisa Kudrow. Jeff Daniels plays Richard Dunn a struggling writer (is there any other kind) who is determined to write a follow-up novel to his not so successful first one. To do this he takes up residence in a seaside cabin and tries to shut off everything else in his mind, his wife Claire (Kudrow), their friends and mostly his imaginary friend Captain Excellent, played by Ryan Reynolds. Captain Excellent has been with Richard since he was a child, he wears blue tights, a red cape, and an unusually large codpiece. The Captain is a rich stew of Richards fear, anxiety and neurosis. A strongly held security blanket that has been with him far too long. Richard ventures into the small resort town to clear his head and runs into a local high school girl named Abby played by Emma Stone in one of her first roles before making it big. Even though Richard is alone in the cabin he hires her to babysit, while he goes out to drink. Upon his arrival back he finds she has made homemade soup, the key to any man's heart. Their relationship is similar to that of Lost in Translation in that it is an older man and a younger woman in a completely non-sexual relationship. Their characters have this deep unspoken understanding of each other. Both are at a crossroads in their life, a sort of limbo waiting for the next thing to come along. Abby has a douche bag of a boyfriend that Richard disapproves of but doesn't want to intervene. Abby also has a male best friend/stalker in Chris who is that painfully stereotypical guy who is stuck in the friend zone and pines for something more. This creates a weird sort of dynamic around Abby and the three guys in her life. With some help, Richard is forced to make some life decisions and opens up to his wife that in turn strengthens their waning marriage. His seemingly eternal writer's block is broke free with his friend and muse Abby and his ultimate dismissal of his need for Captain Excellent. Jeff Daniels always brings it in whatever role he plays from "Dumb and Dumber" to "The Newsroom" and is one of the most underrated actors working today. As for Emma Stone she just owns her role as Abby with a no-nonsense personality and a presence that jumps off the screen. It's a good thing too because the plot in itself is pretty tired and worn out. The filmmaker's poor script was saved by all the actors involved. 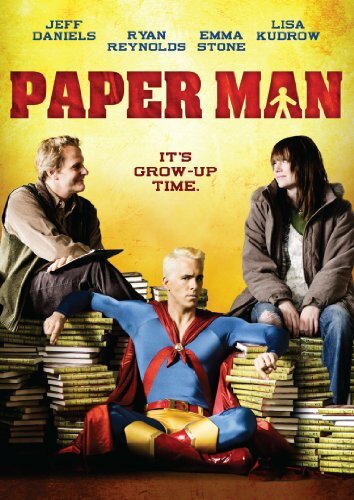 "Paper Man" while starting a little slow really come into its own and makes it a worthy watch.